This year, we waited far too late to take our Santa picture to actually get it on a card. With how busy I've been, I've waited too late to even look at cards. Christmas shopping? Hahahaha Haven't even started. I imagine I'll do quite a bit of shopping Saturday night. Or Maybe even Tuesday night. With all the craziness, there hasn't been any holiday baking. No homemade gifts... I feel like a total slacker. The two in front didn't want to be there. They said they'd rather be studying for finals than take a photo with Santa. Danger Girl was angry because she has curls in her hair. Of course, she's always upset about her curls. I told her to blame her father. She certainly didn't get those curls from me! B and the two little girls were fine until I told them no to cinnabon. Needless to say, they staged a mini revolt on camera. 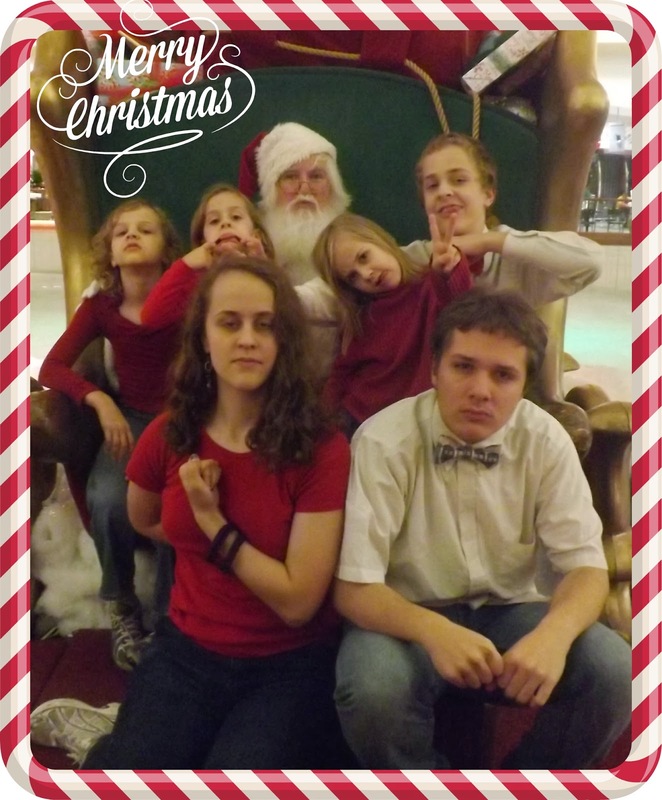 I agreed to snap a few pics of their true feelings before making them put on their happy family faces. And, at their request, I'm only allowed to share this silly picture. Punky Brester is wearing a bright purple skirt. Little Miss' skirt is hot pink. Punky Brewster spilled chocolate on her turtleneck, so we just turned it around. Yup. Wearing her shirt backwards! Leelee actually put on makeup! I feel like my 15 year old daughter's idea of putting enough make up on for a picture is one for the win column. And there's some sort of anime thing going on with her pose. My boys are wearing bow ties because bow ties are cool. The Boy's tie is pictures of the T.A.R.D.I.S. and B's is in homage to 11. Like I said, kids are so weird.